Join the discussion on our forums! Come discuss Drygulch Jailor over in our dedicated Drygulch Jailor discussion topic. 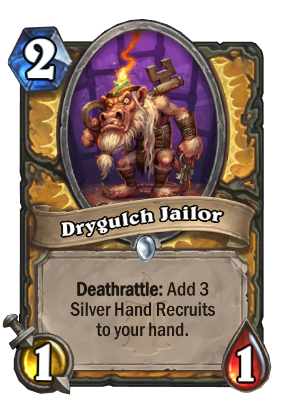 Deathrattle: Add 3 Silver Hand Recruits to your hand. Hard time: 6-10 turns for candle-nappin'. Seeing heavy play in aggro paladin, despite what people rated this. Good with Sunkeeper Tarim and Knife Juggler. maybe a combo with mountain giant? it used to be a thing before Naxx expansion. Ah yes, I love playing 3 mana for 3/3 worth of stats from my hand. What a joy. Not really, but it's definitely a whole lot more situational. This has direct synergy with handbuffs, allowing you to drop 3 one drops that are 4/4's or so. Definitely a worse version I agree.